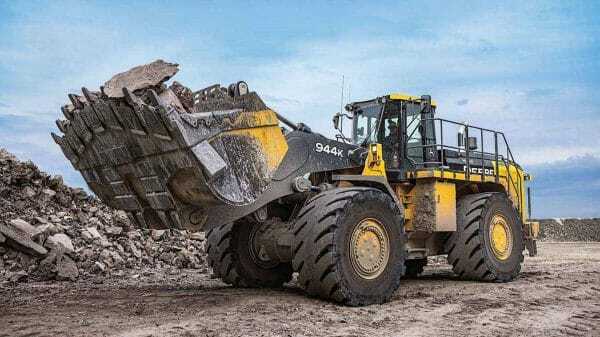 “Customers deserve a dependable wheel loader that actively works to minimize downtime and cut down on fuel consumption,” says John Chesterman, product marketing manager, production class four-wheel drive loaders, John Deere Construction & Forestry. ”New and exciting features on the 944K provide operators with a comprehensive loader solution that increases productivity, while efficiently managing costs. But we also maintained popular features like standard traction control that automatically limits torque to any wheel when slippage occurs, essentially eliminating runaway tire spin and tire slicing.” Equipped with a 536-horsepower, Final Tier 4 John Deere PSS 13.5-liter engine, the 944K boasts nine to 14 percent lower fuel consumption* compared to its IT4 predecessor. The updated engine delivers impressive torque and responsiveness to help maintain good boom and bucket speed in and out of the pile for heaped loads. Fleet managers looking to get the most out of their 944K wheel loader can rely on their John Deere dealers to provide Ultimate Uptime, featuring John Deere WorkSight™. With Ultimate Uptime, owners receive predelivery and follow-up inspections that include five years of JDLink™ telematics, machine health prognostics, remote diagnostics, programming capabilities and the ability to add dealer-provided uptime solutions to a customized package.